Most people who call us at The Center of Success are people just like you. Normal, ordinary people who find themselves stuck. People who want to change part of their lives, but are struggling. It’s normal to want to improve your life. But sometimes it’s difficult. It’s hard to change your habits. It’s hard to change your thoughts. Let me tell you a bit about hypnosis and how it can help you. As long as your issue is doesn’t require surgery to improve, then hypnosis can help. What I mean is, that if it’s in your mind, then we can help. We help by using hypnosis, EFT Tapping, (the Emotional Freedom Technique), and Thought Training. During your first hypnotherapy session you’ll learn what hypnosis really is. Hypnosis is a natural state, a cousin to meditation. You are aware of everything around you, you can speak while you are in hypnosis, and you can remember everything. Some people worry that a hypnotist can make you do things you don’t want to do, such as quack like a duck. This myth came from old stage shows of the past where it appeared as if the hypnotist controlled the people on stage. The truth is that no hypnotist can make you do something against your moral values. What hypnosis feels like is similar to that hazy feeling you get when you are in between your dreamlike state and awake state. Your first hypnosis session is about 1 1/2 hours long. You’ll be experiencing hypnosis and answering questions about your issue. Of course, everything is confidential. During your sessions you’ll learn new tools that will help you feel better about yourself and your life. At home you’ll be reinforcing what you experience in hypnosis by doing self-hypnosis. Self hypnosis takes about 3 minutes in the morning and evening. Self-hypnosis is easy to learn and is essential in helping your inner mind make the changes you want. Am I asleep when I am in hypnosis? No. Even though the word “hypnosis” comes from the greek word meaning “sleep”, you are fully awake, able to talk and move around. Hypnosis is a natural state. It’s that state you pass through right when you wake up in the morning and go to sleep at night. Tomorrow when you wake up notice how nice that feeling is…you know…that feeling between your sleep state and awake state. Hypnosis is described as a state of “focused concentration”, similar to watching a movie and no longer aware of the people around you. Many people have experienced “Highway Hypnosis” too. This occurs when you are driving and realize that you haven’t remembered the past few miles. So hypnosis is kind of like meditation? Yes. The main difference is that rather than letting your mind wander, you will focus your attention on the outcome you are looking for. No. You can open your eyes at any time. Can you make me reveal any secrets when I am in hypnosis? Can you take control of my mind and make me do things I do not want to do? No. If I could, I would have hypnotized my children to happily clean their rooms every day. I tried. It didn’t work. Young children, people high on drugs or alcohol, and those with developmental disabilities are not good candidates for hypnosis. Every client who experiences hypnosis also uses self-hypnosis at home. Self-hypnosis is easy to learn and use. It’s also the most effective way to reinforce the changes you desire that we work on during your hypnosis session. How will I know if I am a good candidate for hypnosis? Good question. As long as you want to experience hypnosis, you will. During your session you will experience a short “practice session” so you feel totally comfortable and understand the state of hypnosis. Is there any research about hypnosis? Yes, and more research is published yearly. There are over 5,000 research studies on the subject. Do you think hypnosis will help me? As long as you want to make a change, then hypnosis is the easiest way to create the change you want. What is the difference between hypnosis and therapy? Hypnotherapists help every day people with every day issues. Hypnosis is a strong outcome related field. Unlike therapy there may be very specific goals you want to address during your hypnosis session. As a hypnotherapist I want to know what is going on, how you want to feel, and what you want to do differently. While traditional therapy is a conscious process, as a hypnotherapist I work with the subconscious mind to help you change how you feel about yourself and your goals. More important, I teach you the tools you need to help you retrain the neural pathways in your mind so you consistently feel good. Most traditional therapy works with the conscious mind with a goal of understanding. When a client experiences insight sometimes the issue can dissolve. With therapy getting to the core issue may be important. Everything starts with a thought. When your thoughts aren’t in alignment with your desires, then you are guaranteed to struggle. Through your sessions you’ll be learning how to change your thoughts to reach your goal easily – without STRUGGLING. We have developed Thought Training(TM) which is a technique to help keep negative thoughts away. You will learn this tool to help you create the positive thoughts that you need to achieve your goals. 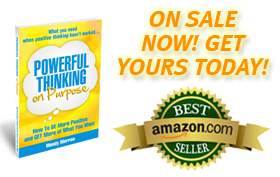 Discover a proven way to train your thoughts and reduce your stress while increasing your confidence in Wendy Merron’s new book, Powerful Thinking on Purpose. Hypnosis and hypnotherapy have been proven to help people to stop smoking easily, lose weight, stop hair pulling (trichotillomania), improve sports performance, eliminate fears anxiety about speaking in public. If it begins in your mind, then hypnosis can help. WILL HYPNOSIS HELP ME GET OVER MY FEARS ABOUT SPEAKING IN PUBLIC? We’ve helped hundreds of people get over their fears and anxiety about speaking in public. Whether you feel nervous talking to one person to a thousand people, it’s really all in your head. Just as it was so easy to develop your fear, it’s just as easy to get over it. When you are ready to feel better, increase your confidence, and achieve more, call us. Not close to Wayne, PA? Clients from all over, including Europe, find it easy to use Skype and for person sessions. Want to learn more? Schedule a free consultation with Wendy Merron, Board Certified Hypnotherapist. SCHEDULE A CALL WITH WENDY. Or Call 610-687-1047. The Center of Success has been helping teens and adults since 2009 and is located in Wayne, PA, close to Chester County, Delaware, Montgomery, and Philadelphia Counties. We are in the heart of the Mainline and a short drive from Philadelphia, Bala Cynwyd, Malvern, Villanova, Chadds Ford, West Chester, Swarthmore, Bryn Mawr, and Jenkintown.